The original gentleman’s motor yacht the Riva Ariston truly is a special yacht that combines the timeless class of an 1950’s design with driving capabilities that continue to be unmatched. 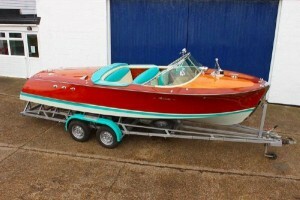 This 1961 Riva Ariston is in remarkable condition throughout and the original engine was fully rebuilt in 2016. She has been maintained to the enth degree and is ready to continue making memories for many years to come. The Riva Ariston comes with a twin axle road trailer. Ruby was acquired by myself in 2004 in Nieuwpoort, Belgium. Since then I have used her extensively on the Continent attending Riva Historical Society events in Holland, France, Monaco, and of course Italy. In 2016 I decided to restore her and put her in the very capable hands of Tom Neale of Fine Wooden Boats in Sarnico a Riva restorer, repairer and broker. Everything on the boat has been restored. New bottom, topsides repaired and re-varnished 20 coats, re-chromed brightwork, new upholstery and cockpit flooring, rebuilt engine by Peter Knight Racing (V8 Specialist),new fuel tank, re-furbished gauges and new switches.